Canada doesn't go up against the United States in very many scenarios, unless you're Trey Parker and Matt Stone. Generally speaking though, Americans have little problems with our friendly neighbors up north. There are some in the United States who want to stir the pot a little and Image Comics is one the one holding the spoon. 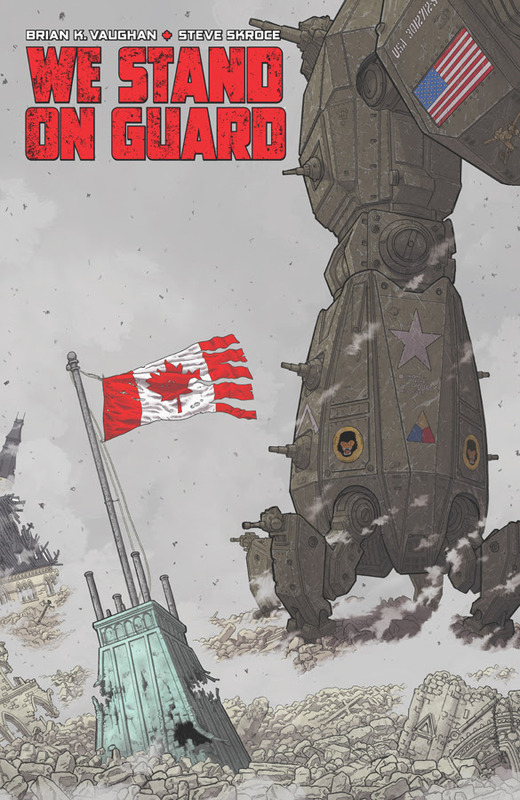 To promote the release of We Stand on Guard #1 by Brian K. Vaughn and Steve Skroce, the publisher will be kicking off an international signing war. Vaughan and Skroce will be enjoying Canada Day, July 1st, in the United States, with an epic release party at the world-famous Meltdown Comics in Los Angeles, CA from 7 – 9 PM. Then, they’re be spending their Independence Day, July 4th, in Canada, at the acclaimed Golden Age Collectibles in Vancouver, B.C. at 1:30 PM. Both events are free to the public, and the oversized 40-page first issue of We Stand On Guard is priced at only $2.99. Vaughan and Skroce will be happy to sign whatever readers bring—time and lines permitting. We Stand On Guard is an action-packed military thriller about a futuristic conflict between Canada and the United States, so in honor of their story, the creators will be appearing together at two different signings, one in each of their home countries. And if you’d rather not pick a side, Vaughan and Skroce will also be appearing together at this year’s Image Expo on Thursday, July 2, on the relatively-neutral ground of San Francisco, at the Yerba Buena Center of the Arts.